In 1971, eight (8) minority business and community leaders identified the need for ensuring a level playing field for minority owned construction companies. Together, they paved the way for MBC to become a leader in creating pathways for success for minority contractors and other construction professionals. Our founder and first Executive Director was E. Pat Larkins, a local businessman and city commissioner who worked with this team of like-minded professionals to craft and mobilize our mission: Ensuring that highly skilled minorities and women are fairly represented within the local, state and global construction industry. After more than four decades, Minority Builders Coalition Inc. is one of the largest and most influential construction trade organizations in South Florida. MBC members are general contractors, subcontractors, architects, engineers, material suppliers, corporations, service providers and more. 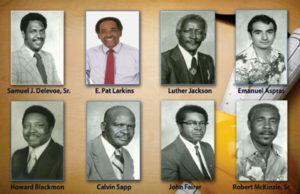 MBC remains committed to the visions, intentions and legacy of Mr. Larkins and our founders. The Minority Builders Coalition, Inc. is a nonprofit, tax-exempt charitable organization under Section 501(c)(3) of the Internal Revenue Code. Donations are tax deductible by law.